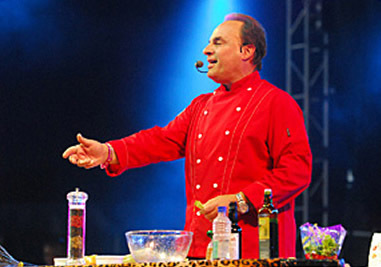 Andy LoRusso – “The Singing Chef” – is a best-selling author and cooking icon, thanks to the success and ongoing popularity of his timeless book, Sing and Cook Italian, and his unique cabaret cooking shows. From an early age, Andy has had a combined intrinsic sense of both music and food. Growing up in New Jersey, he was extremely close with his large Sicilian family and recalls being in the kitchen as a child and watching his grandmother Grace cook. As soon as he was tall enough to reach the table, Andy was cooking meals for himself. 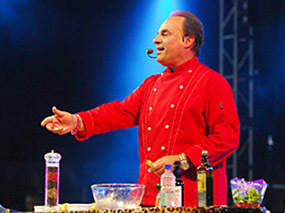 These days, “The Singing Chef” spends more time on the road than at home as a sought-after featured performer at state and county fairs, Italian festivals, home & garden shows, and related trade shows, as well as casinos and resorts around the world. In addition, for his more savory fans, Andy caters “Sing & Cook” lunch and dinner shows for a steady stream of tour groups at high-profile restaurants across the country. His talents have been showcased by numerous national and international media outlets including, The Food Network, Donny & Marie, and numerous local morning TV shows, among many others. THE SIGNING CHEF ANDY LORUSSO HAS MANY FANS ALL OVER THE GLOBE, FROM HIS SHOWS IN ISTANBUL, TURKEY, TO THE WELL KNOWN ISLE OF WIGHT FESTIVAL IN THE UK! THIS VIP SPECIAL EVENT SHOW IS ONE OF THE MOST SOUGHT AFTER BOOKINGS IN THE USA! Includes a full four course gourmet Italian dinner cooked and served by the local caterers and chefs of the venue. During the 90-minute show, beautiful color images of Italy are projected on large screens around the room, as Chef Andy prepares a few items on the dinner menu while singing Italian arias and love songs. A full evening of entertainment and interaction package that gets everyone involved. Your VIP’s are made to feel welcomed and taken care of as if they were on a cruise to Italy with The Singing Chef.